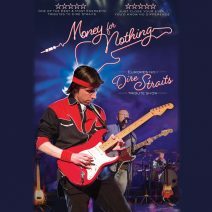 ‘Money for Nothing’ is a ‘must see’ for any rock enthusiast or Dire Straits fan and are undoubtedly the best Dire Straits Tribute Band in Europe. Dire Straits sold in excess of 120 million albums worldwide and ‘Money For Nothing’ features all the hits from their first ever single ‘Sultans of Swing’ to ‘Brothers in Arms’, ‘Walk of Life’ and their last single released in 1992 ‘The Bug’. ‘Money for Nothing’ has performed all over Britain, Spain, UAE, and the Gulf and are now taking the UK Theatre circuit by storm!